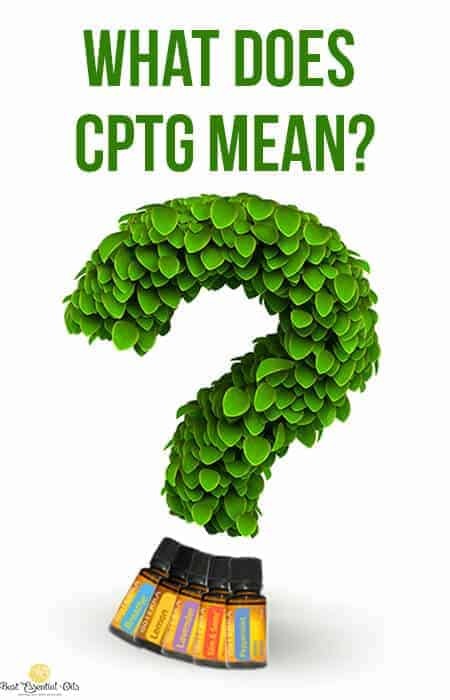 What Does doTERRA CPTG Certified Mean and Why It's Important? In this article, you will learn what doTERRA CPTG Certified means and how doTERRA’s essential oils are superior to others because of it. Other brands of essential oils are considered “therapeutic grade,” which is unregulated. doTERRA wanted to develop a new standard due to lack of regulation and, therefore deceptive, quality and contents that can be passed off under such labeling. Because organic certification varies so much from one country to another, it is not possible to acquire all essential oils under organic status. So doTERRA created their own quality control standards that exceed the industry standards for organic/therapeutic and they decided to call it CPTG (Certified Pure Therapeutic Grade). dōTERRA’s essential oils are extracted from the right species, the right part of the plant, in the right environment, during the right period and distilled under the right conditions. As a general rule, the farther down the supply chain you go, the less likely you are to be getting pure product. There are a lot of companies out there selling essential oils and most of them have no ability (or in many cases, no desire) to do the necessary quality control to verify what they are getting from their supplier before they pass it on to their customers. doTERRA is working directly with growers all over the world to obtain essential oils directly from the source. This has an extremely positive ecological, economic and environmental global impact. To further understand what CPTG means, it’s helpful to read the example in my post on Co-Impact Sourcing about how Vetiver is sourced from Haiti. It explains why it is so important where the plants are grown. It really does matter where it’s grown because the chemical composition is different in different environments. What Does doTERRA CPTG (Certified Pure Therapeutic Grade) Mean? You can read details in the Spring Living Magazine about what goes into quality control with doTERRA. For more details on CPTG, please read doTERRA’s CPTG brochure or their paper on CPTG Testing Methods. If you would like to read more about essential oil myths, including ones about sourcing and grades of oils, this article from Dr. Pappa’s may be interesting to you. doTERRA Essential Oils Uses – How Much Should I Use & How Often? Are doTERRA Essential Oils Safe? Why Do doTERRA Essential Oils Smell Better? Note – these are my notes from the doTERRA 2014 Convention from a presentation done by Laura Jacobs. « Do Citrus Essential Oils Cause Photosensitivity? If this CPTG certification is everything it claims to be- why aren’t DoTerra oils certified organic? Wouldn’t hat be considered a superior certicification? So, I just re-did the article because I realized it didn’t really answer that question very well. You can read it again, but the main section I hope will make it more clear to you is this: Because organic certification varies so much from one country to another, it is not possible to acquire all essential oils under organic status. So doTERRA created their own quality control standards that exceed the industry standards for organic/therapeutic and they decided to call it CPTG (Certified Pure Therapeutic Grade). There is a number on each bottle and you can go to this website – https://sourcetoyou.com/ and type in the number on each bottle and it will show the GC/MS test results from an independent, verified third-party lab for that exact bottle.